Reference number for this case: 12-oct-54-Gaillac. Thank you for including this reference number in any correspondence with me regarding this case. A GIANT ROCKET, taking off from a field, was seen by M. Pierre Vidal, cook, residing at Croix Daurade, near Toulouse, and his nephew, Ange Hurle. It disappeared in a bright orange and pale green wake. At the presumed location of the rocket, the grass was covered with a fatty vapor with an oil smell. A professor of mathematics from Lisieux, Mr. Bon, saw in Saint-Germain-de-Livet, above a wood, a silvery disk seven or eight meters; which rose silently in the sky, rotating on itself. After diving to the ground from an altitude of about 800 meters, it left again at the horizontal at a dizzying pace. A GENERAL COUNCILMAN, a coffee-maker, a rugby player and a swimming champion, saw above the chapel of Romilly in the direction of Montgelas (Rhone) a flying saucer looking like a ball of fire. A three meters high bell, moving with twelve meters jumps in an orange glow and emitting greenish sparks, was seen for an hour on the Evreux Louviers railway by an artisan, his apprentice and a farm worker. A LUMINOUS MUSHROOM, which moved quickly and silently, was seen Monday evening around 9:30 p.m., by Mrs. Drouillard, at La Roche-sur-Yon. A FLYING CIGAR, of metallic appearance, from which three red balls detached, was seen by Messrs. Roger Thévenin and Albert Daury, guardians of the peace of the urban body of Riom (Puy-de-Dôme). ANOTHER CIGAR, surrounded by iridescent lights was observed in Bompas (Pyrénées-Orientales) by the baker M. Sebelli. AN OBLONG-SHAPED ENGINE, moving in the sky as in a big "S" and making a sound of steam under pressure was seen by three young hunters above Gaillac (Aveyron). The same machine was reportedly observed in Pont-de-Salars. The two authors indicate that in Gaillac d'Aveyron in the department of Aveyron on October 12, 1954, there was the observation of a cigar flying in some large S-like travels. The source is given as "Le Figaro" for October 13, 1954. Luc Chastan indicates that in the Aveyron in Gaillac d'Aveyron on October 12, 1954 at an unknown hour there was an "Observation of a cigar performing of the kinds of large S's." The website indicates that on 12 October 1954 in Gaillac, France, an unidentified object was observed, but with an appearance and a behaviour that most likely would have an ordinary explanation. "One object was observed at a mountain." The sources are indicated as Michel, Aime, Flying Saucers and the Straight-Line Mystery, S. G. Phillips, New York, 1958; Vallee, Jacques, Computerized Catalog (N = 3073); Vallee, Jacques, Challenge to Science: The UFO Enigma, Henry Regnery, Chicago, 1966; Vallee, Jacques, Preliminary Catalog (N = 500), (dans JVallee01); Hatch, Larry, *U* computer database, l'Auteur, Redwood City, 2002. Not looked for yet. Possible jet fighter planes. 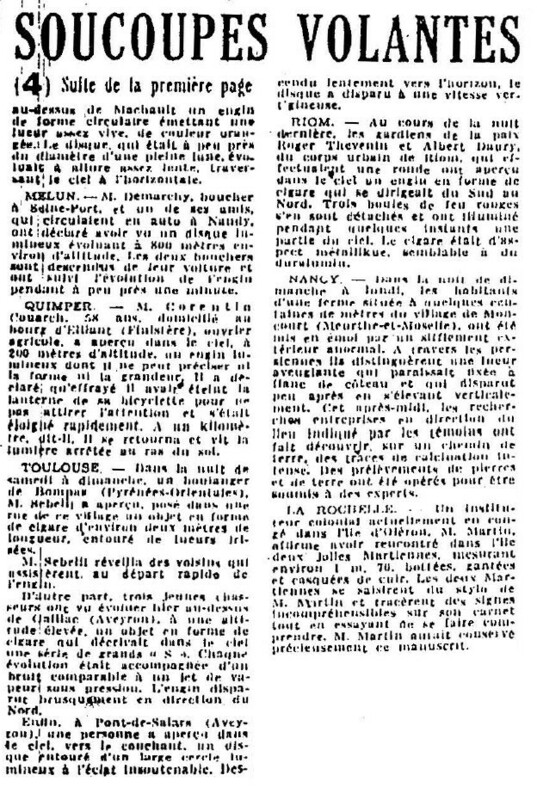 [fs1] Article in the national newspaper France Soir, Paris, France, October 14, 1954. [am1] "Mystérieux Objets Célestes", book by Aimé Michel, Arthaud publishers, 1958. [am1] "A Propos des Soucoupes Volantes", book by Aimé Michel, reprint of "Mystérieux Objets Célestes", Planète publishers, page 205, 1972. [fr1] "OVNI, Premier Dossier Complet des Rencontres Rapprochées en France", book by Michel Figuet and Jean-Louis Ruchon, Alain Lefeuvre publisher, France, page 158, 1979. [---] *U* Computer Database", compiled by Larry Hatch, USA, 2002. 1.0 Patrick Gross March 11, 2009 Conversion from HTML to XHTML Strict. First formal version. Additions [lc1], [ud1], [ud2]. 1.3 Patrick Gross November 20, 2016 Additions [er1], [ub1]. 1.4 Patrick Gross December 30, 2016 Addition [fs1].